Doesn't quite click on all levels, and the story and character development feels truncated, but there's still plenty to enjoy about its weird occurrences. 80 min. Walt Disney Studios Distribution. Director: Henry Selick. Cast: Susan Sarandon, Joanna Lumley, Miriam Margolyes, Pete Postlethwaite, Paul Terry. When it comes to produce-themed adventure, it doesn't get much better than James and the Giant Peach, Roald Dahl's 1961 children's novel that sends a giant peach to the Big Apple. On the strength of the stop-motion-animated The Nightmare Before Christmas, director Henry Selick won the right to make James and the Giant Peach into a feature film for Disney. Over thirty of the film's eighty minutes are live action, while the rest is stop motion; the two visual styles cross over briefly. The results are likewise somewhat mixed, but the adaptation by Selick and screenwriters Karey Kirkpatrick (The Hitchhiker's Guide to the Galaxy) and Jonathan Roberts & Steve Bloom has its charms. The story wastes no time in orphaning nine-year-old James Henry Trotter (Paul Terry), when his parents run afoul of a rampaging rhinoceros, depicted, from James' perspective, as an otherworldly force. James' life becomes a Dickensian hell under the thumbs of his evil Aunt Sponge (Miriam Margolyes) and Aunt Spiker (Joanna Lumley). By (gloomy) day, James longs to play with other children but instead suffers practical enslavement, neglect, verbal abuse, and beatings; by night, he looks out his window and dreams of going to New York City, an intended destination of his former life with his parents. Potential escape arrives in the form of a mystery man (Pete Postlethwaite) who offers the boy magical, glowing green crocodile tongues. When the errant tongues bestow their great power on a lone peach in James' yard, the fruit grows to gargantuan proportions. The evil sisters immediately set to exploiting the peach as an attraction, but James discovers (with the help of one last crocodile tongue) that the peach can provide him passage to a world of adventure. With this epiphany, James also gains a new group of friends: posh Mr. Grasshopper (Simon Callow), not-so-posh Mr. Earthworm (David Thewlis), langorous Miss Spider (Susan Sarandon channeling Garbo), chipper Mrs. Ladybug (Jane Leeves), quiet Glowworm (Margolyes) and Brooklyn-born rascal Mr. Centipede (Richard Dreyfuss). The narrative has a loony, manic edge to it, evoking in a roundabout way the off-kilter Dahl (the film is, in its broad strokes, faithful to his book); it also provides wonderful challenges for Selick as an animator: choppy seas, James' task of tethering one hundred seasgulls to the peach, and an underwater sequence pitting Centipede against Harryhausen-esque pirate skeletons (make that Skellingtons, in a tip of the hat to The Nightmare Before Christmas). Selick and company employ stop-motion, cut-out photo animation, and cel and CG techniques, all of which show more confidence than the cramped, rough style of the live action sequences (plus, in live-action, Terry is a bit of a zero). Randy Newman probably isn't the best choice to provide the music for a Roald Dahl story; nevertheless, as the Toy Story films (and others) have shown, he has a charming touch for family material. Here he contributes a song called "Family," as well as five others ("My Name is James," "That's the Life," "That's the Life (Reprise)", "Good News" and "Eating the Peach," which features Dahl's lyrics). In another Pixar connection, the dearly departed Joe Ranft serves as co-storyboard supervisor here. James and the Giant Peach doesn't quite click on all levels, and the story and character development feels truncated, but there's still plenty to enjoy about its weird occurrences. At least in this case, audiences would be best served by heeding the stranger's advice to James that he'll find the answers he's looking for not in his head but in his heart. 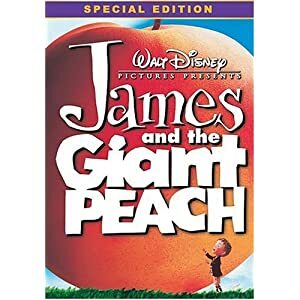 In its Blu-ray debut, James and the Giant Peach arrives in a Blu-ray + DVD special edition that's a bit underwhelming. It's hard to appraise the hi-def transfer without knowing more about the source. My admittedly hazy memory of the theatrical exhibition is that the live-action sequences looked pretty grotty from the start; certainly they appear dingy, grainy, and a bit unstable on home video. How much of the instability owes to a weak transfer and how much to a cheaply produced live-action source element isn't entirely clear, but the picture does flutter suspiciously, and crush is evident in these almost entirely dark scenes. The animated midsection sharpens up considerably, and the colors of this brighter passage pop, making the transfer a mixed bag but still a welcome improvement over standard definition. It would be nice to say that the extras package offers compensatory value to this set, but it doesn't. The Games & Activities section houses the Blu-exclusive Spike the Aunts Game (HD), cleverly patterned after one glimpsed in the film. But it's, y'know, for kids. Under Original DVD Features, you'll find the paltry EPK "Production Featurette" (4:34, SD), including some behind-the-scenes glimpses and interview clips of director Henry Selick, director of photography/visual effects supervisor Pete Kuzachik, animator Mike Belzer, Susan Sarandon, Jane Leeves and co-producer Brian Rosen. We also get the "'Good News' Music Video by Randy Newman" (2:29, HD), the "Original Theatrical Trailer" (1:27, SD) and a Still Frame Gallery (HD) divided into Concept Art, Puppets, Behind the Scenes, and Live Action. The Mouse only knows why we don't get a commentary track from Selick to bolster less than ten minutes of bonus features. It's going to be a tough call for current owners of the DVD edition, but if you haven't yet added this winning fantasy to your home-video collection, it's an easier decision. All site content © 2000-2019 Peter Canavese. Page generated at 04/20/2019 11:30:44PM.